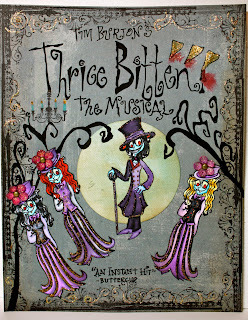 Thrice Bitten, The Musical featuring such hits as "Turning Blue Over You", "Meet Me in Transylvania" and "Bloodsicles Make Me Batty"!!! Other: My own handwriting :D & creepy trees/diamond stickles/3 brads with flowers/some jewels for bow tie bling. Thank You for haunting by. Mind the bloody puddle on your way out! Welcomings. Openings. Portals to stars. A life without bars, without limits, with all the potential only you can give yourself. That is some of what Freedom is. And of course, BBQ's, hotdogs and lots and lots of illegal fireworks! Thank You Stampotique for challenging us to get our Freedom on! Enjoy and Thank You for Blogging By!!!!! Welcome Everybody!!! I am so super excited about the challenges posed this week by both The Burtonesque Dolls and by Oh, Alice!!! 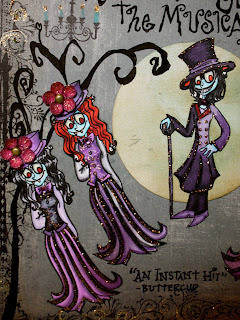 I have always loved the cutesy, somewhat creepy quirkiness of Tim Burton's characters. And of course, who doesn't love a little sparkle on top of all that is strange?! I know I do. The Burtonesque Doll Challenge: Create a tag which is inspired by the film Beetlejuice. The Oh, Alice! Challenge: Add some twinkling, glitter or sparkle to your stamping sensation. WHAT THE GREEN IS: It's plastic I painted bright green before using the Caged Bird die to sizzix it. Now for some Tim Burton stories: When I was 19 I wrote him a letter telling him he should put me in his films. I have yet to hear back from him. I'm sure he just hasn't gotten around to it yet... :-D And one more Burton story: One of my father figures designed these really wonderful greeting cards in the 90's. Tim Burton actually contacted him, (this was my mom's boyfriend), INVITED him to HIS OFFICE, showed him drawings of his characters (which had yet to be made and shared with the public). 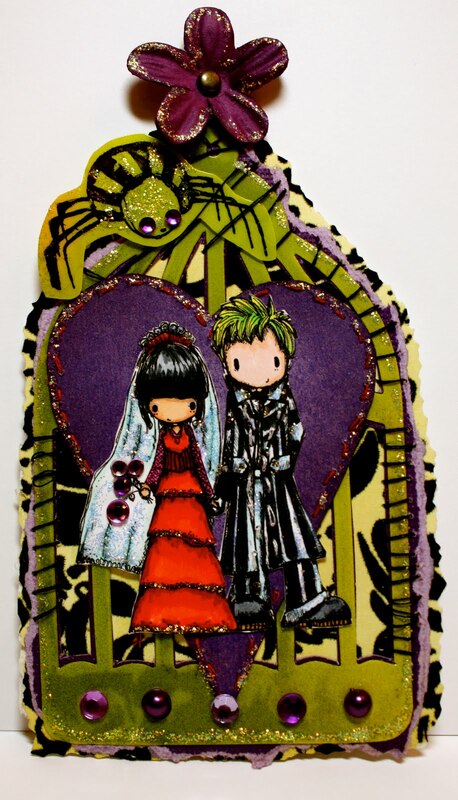 Tim Burton wanted him to use his characters to make a line of greeting cards. Unfortunately, the money behind the card operation said "no" :( Sad face. SO CLOSE....but so far away. Oh Tim Burton, one of these days...P.S. my new crush is the man judge with the hair on Last Comic Standing (an American tv show). And that concludes the TMI session of this post. Ok back to the craftiness, THANK YOU BURTONESQUE DOLLS for existing!!! I feel I have found another crafty blog home:) And OH, ALICE! and STAMPOTIQUE. And now, TIDDLY INKS! I just found out about you yesterday and look! I got me a "happy couple"
BUTTONS, FLOWERS and BLING, OH MY!!! Practical Scrappers challenge to use flowers in any way/Crazy 4 Challenges http://crazy4challenges.blogspot.com C4C42 in which we are asked to use a flower in our project (either store bought or handmade will do)/ The Greeting Farm Splendid Stamping challenge to use at least 3 buttons in our work/and Anya Ink's http://anyaink.blogspot.com pose to add some bling in our creation!!! STAMPS: By The Greeting Farm: "Fleur Anya" and Aloha from "Anya Says"
INKS: Tea Dye and Dusty Concord Distress Inks/Adirondack Watermelon (which I used for the flower edges and backs & around "aloha"
OTHER BLING: Brads, some hand stitching around the outer edge, Deco Color Hot Purple opaque paint pen for dotted border, Black Pen for the hand-drawn swirl on bottom and of course STICKLES!!! On dress, flower edges, "button" flowers, dragon fly and whatnot! Making these flowers was so much fun! I just HAVE to show you a view from above! (so you can see how 3-D they really are! Also, I had NO ROOM to add my biggest flower but I just had to show you anyway! So, the lone flower is my big guy which was just too overpowering for this particular set up. I appreciate you stopping by! Feel free to leave a comment! Or perhaps even FOLLOW me:) You could be lucky #7! "Crazy for Daisy Chains" Oh, Alice challenge! We meet again. As you can see, I got a little Stickles happy and couldn't help but sparkle up this card, even though it is for Father's Day...who says a Dad can't enjoy a little sparkle while he surfs? Why not, I say! 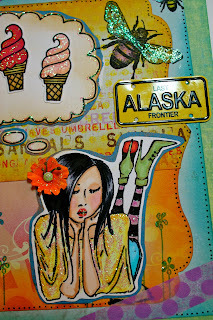 This card is inspired by the Oh, Alice Chapter #18 Crazy for Daisy Chains sketch challenge! We are to use the sketch they provide on their blog and add a daisy or a flower similar to a daisy somewhere in the design. PRODUCTS USED: Stamp: Surfer Ian by The Greeting farm. I can't believe I only used ONE STAMP!!! This is a first! Papers: all papers by Jen Wilson for My Mind's Eye "Betty Boards" Paper. Colored in copics and Tim Holtz distress ink: spicy marmalade and blue china. 3 black brads. one nonblack brad for the flower. Black pen for my own little handwriting of the sentiment (which I know is currently missing a comma:( I'll fix it maybe) and lots and lots of STICKLES!!! clear and silver for the the dots on the brown background paper. And of course TONS OF LOVE!!! The birds and the bees, lounging outside, a flower in your hair, daydreaming of life's simple pleasures. So, as for what products I used, here goes: STAMPS:ice cream cone by A Muse Art Stamps/All other stamps by Stampotique including: Jasmin, Medium Bee with Tiny Bee Mounted on Side, Daisy Daisy all by Jo Capper-Sandon; and 2 Sided Bird by Josie Cirincione. COLORED in copics & Tim Holtz distress ink (tea dye, spiced marmalade & broken china). Violet Cake Washi Tape by The Greeting Farm (that's the purple tape on the corners). A flower and a brad. My own scribbles for the thought bubble. And a little license plate. Clear Stickles. PAPER: the pinkish one with the swirly design is from "me & my big ideas" paper pad/the blueish middle paper is "Betty Boards" it's time breaking free, Jen Wilson adventure series/ and the outside greenish one is Jen Wilson's 29th street market "fresh brothers vine scroll/green grass paper". THANK YOU for visiting! I really do appreciate it. Thank You! Howdy Crafty Bloggers! Here is a little card I put together for The Greeting Farm's Mercy Sketch Challenge 6-11. I love having a sketch as inspiration. It's fun to deviate a little from the layout too! STAMPS: Angel Anya and "You're an Angel" by The Greeting Farm. Colored in COPICS. Stickles for some sparkle! A variety of scrap paper which I ripped, placed and glued wherever I felt it looked best! Paper flowers by Bazzill Basics and by Hero Arts. A white pearly button. Hand stitches around the edges for that homemade look which I love so much. If you have any questions or comments, I would love to hear them! THANK YOU so much for blogging by! And Thank You to the Greeting Farm for challenging us with this super fun sketch!